Rochester's Human Rights Day, held this year on December 10 at Downtown Presbyterian Church, focused on "the new Jim Crow," the theme of Michelle Alexander's recent book, The New Jim Crow: Mass Incarceration in the Age of Colorblindness. (1) responses from a panel of local residents directly affected by the policies of the "new Jim Crow,"
(3) a call to action. 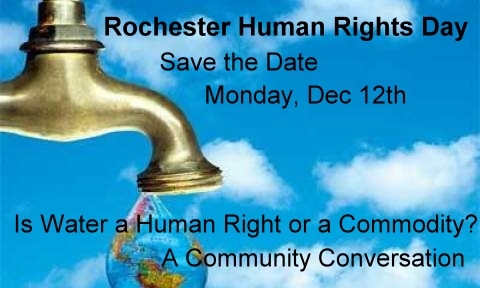 We urge you to focus with us on the threat the "new Jim Crow" poses for the entire community, not just people of color, and to join others already engaged in addressing new manifestations of racism both here in Rochester and nationally. Dr. Marvin McMickle: The recently inaugurated 12th President of Colgate Rochester Crozer Divinity School, Dr. McMickle comes to us from Cleveland where he served as Senior Pastor of Antioch Baptist Church. During that time he established an HIV/AIDS and a job training ministry, a hunger center, three AA units, a marriage enrichment program, a credit union and a tithing program in which the congregation tithes out to the community 10% of its annual income every year. sponsored by the state of Ohio. He served as president of both the NAACP and the Urban League in Cleveland, as well as serving as president of the Shaker Heights Board of Education and the Karamu House Performing Arts Center and a member of the Board of Trustees of Cleveland State University. He served on the adjunct faculty at Princeton Theological Seminary, New Brunswick Theological Seminary, New York Theological Seminary and Ashland Theological Seminary and was Visiting Professor of Preaching at Yale University Divinity School. He also taught Bible Study at Sing Sing prison in Ossining, New York. An eloquent speaker, Dr.McMickle twice ran for Congress. He is the author of 12 books and has also authored dozens of articles for professional journals and magazines. Dr. McMickle has been married to Peggy Lorraine Noble since 1975 and they have one son, Aaron who resides in New York City. Rosemary Rivera: A Director for Citizen Action of New York working on electoral and issue campaigns at the state and national level. She is married and has 3 children and 2 grandchildren, two dogs, a cat, and a snake. Ricardo Adams: A dedicated community activist with much personal experience in poverty, prison and homelessness. He is a happily married father of three daughters and has a passion for making a difference. Maurice Miller: At 24, currently employed at the Rochester Convention Center and pursuing higher education, he previously worked and volunteered for Teen Empowerment. He has a beautiful two year old daughter. Please check back to this page, the website as a whole and our Facebook and Twitter pages for updates on the program.